With no added colors, artificial flavours and sweeteners, gingerbread requires special attention in manufacturing, which is well deserved and received. In the rooms of once small, family factory, established in 1991, the aromas of clove, nutmeg and cinnamon awake all scences. In its earliest beginnings, gingerbread production took place in a small space, but filled with a lot of attention and love. Each ingredient has passed the rigorous controlls and only the finest examples of the finished product reach the consumer. 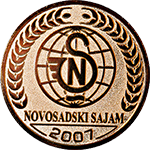 We are proud to, though now a big company, have saved the same principle of selection of raw materials and the criteria that will satisfy the taste of the most prestigious confectionery. The development of technology has only improved the quality of the gingerbread, but not in the manner of its production. We kept the tradition and still produce gingerbread manually. In addition to the finest spices, personality and distinctive, recognizable taste honeybun give commitment and faithfulness to the original recipe. 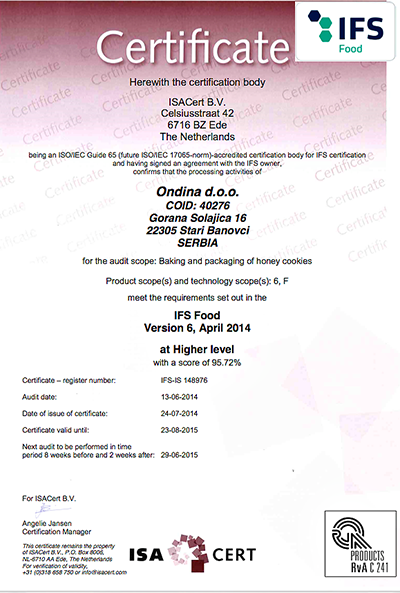 Ondina has impplemented HACCP standard since 2007, and IFS standards since 2013. Today honeybun residents enjoy throughout Serbia and the region. With the confidence gained, we have expanded our export even through Canada and Australia.